Soap Nuts are the dried fruit of the Soap Berry tree. They are a 100% natural alternative to harsh chemical detergents and cleaners. Soap Nuts are eco-friendly, biodegradable, hypoallergenic, unscented and highly effective. They also offer a plethora of other household cleaning solutions - all totally chemical-free! If you have allergies or are sensitive to harsh chemical detergents and cleaners, Soap Nuts are like a dream come true. They are easily converted to soap nuts powder or liquid - see our Soap Nuts FAQ for more information. There are two primary species (Sapindus Mukorossi and Trifoliatus). Mukorossi is a larger tree with larger fruits. All of our Soap Nuts are of the premier Mukorossi variety and are properly cleaned, sun-dried and de-seeded, ready for use! 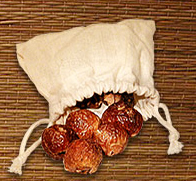 We are offering hand-sorted, select organic soap nuts of the highest quality. They are sorted, inspected and packaged in the USA. Each order for soap nuts will come with a durable muslin wash bag and a pocket-sized 8-page pamphlet with details on how to use them. If you would like to purchase additional wash bags they are also available separately. For more information on our Soap Nuts, including instructions on how to use them, you can visit our Soap Nuts FAQ page.